The West End premiere of The Inheritance at the Noel Coward Theatre. Following a sell-out run at The Young Vic Theatre, Matthew Lopez’s ‘extraordinary and epic’ (Sunday Times) new two-part play, The Inheritance will play a limited season in London’s West End. Spanning generations and many interlinking lives, The Inheritance is ‘an exquisitely truthful and funny modern classic’ (Telegraph) that brilliantly transposes EM Forster’s novel ‘Howards End’ to 21st century New York. Exploring profound themes through the turbulent and often hilarious experiences of a group of young, ambitious New Yorkers. What is the legacy left to them by previous generations? What do they owe the future and each other? Multi Olivier Award winner Stephen Daldry directs a large ensemble cast, including John Benjamin Hickey, Andrew Burnap, Paul Hilton, Samuel H. Levine, Kyle Soller and Vanessa Redgrave. Playing across two parts, which can be seen either in one day or across two evenings. 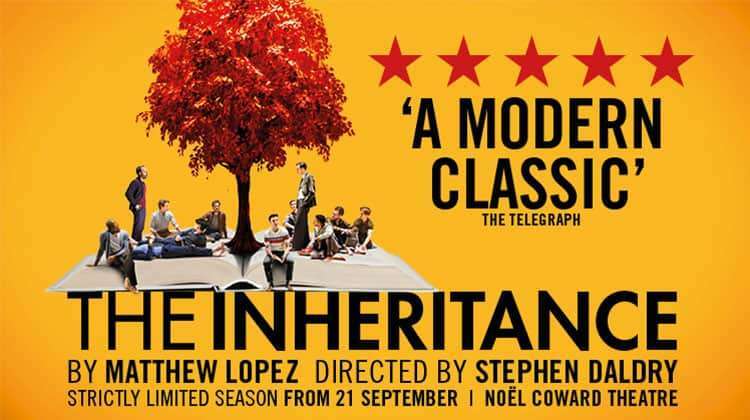 The Inheritance Parts 1 & 2 is booking from 21 September 2018 until 19 January 2019 at the Noel Coward Theatre, London. Matthew Lopez’s major new two-part play explores profound themes through the turbulent and often hilarious experiences of a group of young, ambitious New Yorkers. What is the legacy left to them by previous generations? What do they owe the future and each other? The ensemble cast includes Hugo Bolton, Robert Boulter, Andrew Burnap, Hubert Burton, John Benjamin Hickey, Paul Hilton, Samuel H. Levine, Syrus Lowe, Michael Marcus, Jack Riddiford, Kyle Soller and Michael Walters. Directed by Stephen Daldry with set and costumes by Bob Crowley, lighting by Jon Clark, sound by Paul Arditti & Chris Reid, music by Paul Englishby. Why book The Inheritance Part 1 tickets with us?